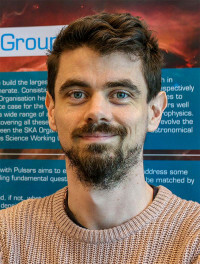 The 2019 MERAC Prize for the Best Early Career Researcher in Observational Astrophysics is awarded to Dr Evan Keane (SKA Organisation, UK) for investigations of the Transient Radio Sky and the discovery of the second Lorimer burst, now known as Fast Radio Bursts. Council’s Centre of Excellence for All-Sky Astrophysics) at the Swinburne University of Technology. Since 2015 he is Project Scientist for the SKA Organisation. His research focuses on searching for radio transients and using them to understand fundamental questions of physics. He has discovered numerous pulsars and rotating radio transients and in 2011 discovered the second "Lorimer burst", events now known as "fast radio bursts" (FRBs). His current role involves ensuring the SKA will achieve all its scientific objectives in transient, pulsar, VLBI, solar and cosmic ray science. Evan Keane has made significant contributions to developing and improving techniques to discover new pulsars, and determined timing solutions for challenging pulsars. He was part of the team that discovered the first Galactic Centre radio pulsar. Evan did the first systematic analysis of all known fast radio bursts, precipitating the Fast Radio Burst Catalogue (FRBCAT). Evan leads the Survey for Pulsars and Extragalactic Radio Bursts (SUPERB) project, a large-scale real-time accelerated pulsar and fast transient search programme with the Parkes telescope in Australia. Evan Keane led the main SKA science case chapter for pulsars, describing the pulsar search yield, optimal search strategies and the science questions that can be addressed by the SKA, such as tests of General Relativity and alternative theories of gravity, gravitational wave astronomy with pulsar timing arrays and physics at super-nuclear density within neutron star interiors using pulsar timing. This work has been conducted at the Square Kilometer Array Organisation, United Kingdom, and at the Max Planck Institut für Radioastronomie, Germany and Swinburne University of Technology, Australia.